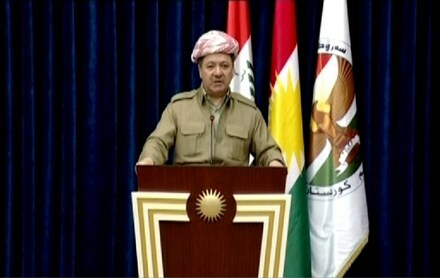 Kurdistan Region President Masoud Barzani says that the time has come for the people of Kurdistan to make a decision through a referendum on their future. In a statement on Tuesday, he also criticized those who have made hostile statements about the holding of a referendum in Kurdistan. The President said that time is now ripe for the people of Kurdistan to decide their future. "The time has come and the conditions are now suitable for the people to make a decision through a referendum on their future. This referendum would not necessarily lead to immediate declaration of statehood, but rather to know the will and opinion of the people of Kurdistan about their future and for Kurdistan’s political leadership to implement this will at the appropriate time and circumstances,” said a statement by the President. "If the people of Kurdistan expect others to present the right of self-determination to them as a gift, independence will never be achieved. That right exists and the people of Kurdistan must demand it and exercise it," the President said.